The issue of finding skyline tuples over multiple relations, more commonly known as the skyline join problem, has been well studied in scenarios in which the data is static. Most recently, it has become a new trend that performing skyline queries on data streams, where tuples arrive or expire in a continuous approach. A few algorithms have been proposed for computing skylines on two data streams. However, those literatures did not consider the inherent parallelism, or employ serial algorithms to solve the skyline query problem, which cannot leverage the multi-core processors. Based on this motivation, in this paper, we address the problem of parallel computing for skyline join over multiple data streams. We developed a Novel Iterative framework based on the existing work and study the inherent parallelism of the Novel Iterative framework. Then we propose two parallel skyline join algorithms over sliding windows, NP-SWJ and IP-SWJ. 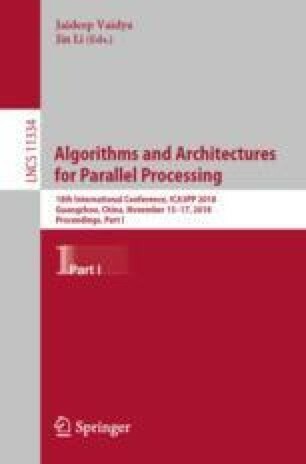 To the best of our knowledge, this is the first paper that addresses parallel computing of skyline join over multiple data streams. Extensive experimental evaluations on real and synthetic data sets show that the algorithms proposed in this paper provide large gains over the state-of-the-art serial algorithm of skyline join over data streams.